The #1 way to sell more by using social media is to learn of opportunities just after a decision maker has experienced a Trigger Event, that makes them realize what they have is not longer sufficient, but before they notice, or worse yet call, your competition – This powerful selling window is called the Window of Dissatisfaction. My experience is that the single most powerful Trigger Event is a change in a decision maker at an organization. You know this scenario. You have an account you want to get into, but the competition is entrenched in the account and no matter how often or how hard you try, you can’t get in. Then, one day, the decision maker at the account changes. Suddenly, resistance disappears and, before you know it, you have yourself a new customer. The opposite is also quite common. You have a relationship with a decision maker, and that relationship allows you to enjoy the benefits of having the ‘inside track’ on a lot of new projects. Then, one day your reliable contact leaves and you lose the business to someone else! Just like MIT’s Lead Response Study shows the odds of contacting a lead if called in 5 minutes versus 30 minutes drop 100 times. The ideal moment to cold call a decision maker is as soon as possible after the Trigger Event has happened and the best solution I have found to learn of these events as soon as possible is TweetDeck. 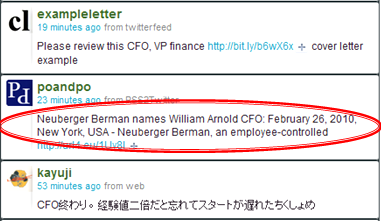 Now for all you Twitter fanatics out there, yeah I get that Twitter is the power behind TweetDeck but who has the time to sit around on Twitter waiting for a decent Tweet – like this one about a new CFO being hired – to show up. My preference is to set up a column inside TweetDeck with a search for lets’ say VP of Sales and then every now and again include a filter that allows me to make the search results relevant to my sales targets. In this case finding more customers in Boston. So this month’s question is how else can you use TweetDeck or something similar to harness a change in decision makers to sell more. Win $1,500 worth of Trigger Event services by submitting either a great example of, or great idea on, how to use TweetDeck or a similar service to sell more. To win the $1,500 prize you must get the most votes for your answer. Answers are submitted by commenting on this blog post. Answers are voted on by clicking on the button that appears at the end of each answer/comment. Winners are announced the last Tuesday of the month – April 27rh – so voting ends at Midnight (MST) on Monday April 26th. Answers/comments need to be approved – to avoid spam – which typically takes just a few minutes. Contact me by phone (+1.403.874.2998), Skype (Craig.Elias), or this contact form, if you don’t see your comment approved within a few minutes of posting it. Use the button below to Tweet , Stumble!, Digg, and email your friends so you get the most votes, because the voting system I use does not allow you to vote for your own answers. Good luck & have an eventful week!